Includes one each of the following seven 25 mm diameter balls: DRILLED - lead, wood, aluminum, brass, and cork; NOT DRILLED - steel and glass. 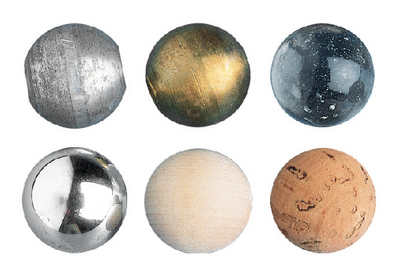 Drilled balls are for pendulum bobs or impact experiments. Un-drilled are suitable for collision apparatus and density/volume experiments. Balls available in sets or individually.